We offer full denturist services at our clinic. 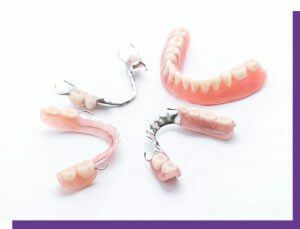 Whether for partial dentures, complete dentures, or dentures on implants, we offer personalized service from consultation through to installation. Our denturist is an expert in the design and implementation of removable dentures. They take all the necessary steps to ensure results that suit your looks and your personality. 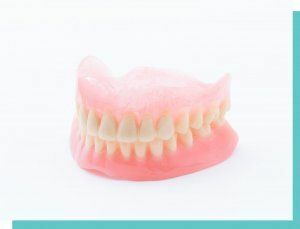 In comparison to full dentures, partial dentures replace one or more teeth without replacing all of your natural teeth. They are often used to improve aesthetics, mastication, and pronunciation. The partial denture is made of a combination of plastic and metal. The metal is used to create hooks to keep the prosthesis in place. As with complete dentures, it can also be removed for cleaning or to sleep. Removable dental prostheses, also known as dentures, replace all your natural teeth with braces made of acrylic resin or a combination of resin and porcelain. They can replace either the teeth of the upper jaw, lower jaw, or both. One advantage of dentures is that they can be removed from the mouth at any time. This allows easier daily maintenance as well as allows the wearer to remove the prosthesis to sleep. The latest alternative to removable dentures, dental implants offer several benefits compared to other dental prostheses. They allow a more stable placement thanks to the implants and can be fixed or removable. Our expert denturist can help you determine what type of prosthesis will be the right choice for you. During the first days after the installation of your new dentures, we advise you to chew your food longer and at a slower pace than usual. This will help you get used to your new prosthetic. It is important to brush your dentures with a soft-bristled toothbrush. We recommend brushing your dentures over a sink half-full of water or putting a washcloth down as a cushion. If you drop your dentures, having a cushion down will reduce the chance of damage. Annual checkups allow your denturist to spot any current or future problem. Don’t wait until you feel pain or discomfort to find out if there’s an issue. Your gums change over time, and without teeth, jaw bone volume decreases from year to year in a process called bone resorption. Wearing a prosthesis that is older than 10 years often irreversibly affects this process. Did you know that wearing the same dentures for more than 5 years without review by your denturist may affect your health?